Not much to tell. It rained on us for 4 days! I had set up a ground blind over-looking a fresh cut soybean field, mostly to hunt over on a late evening. I got up that morning and it was pouring down rain. So instead of sleeping in, I elected to go sit in the ground blind. About 7:30 the rain let up to a point that I thought it was going to stop. My thought was "I need to be in the woods instead of sitting on this big field." So I folded up my chair, put it in its case, and eased across the field onto a big ridge of woods that overlooked the field. I found an old fallen treetop that I decided to use as a blind. I set my rifle down and leaned it against the fallen tree and I started to take my chair out of its case. While taking the case off the chair, some movement at the top of the ridge caught my eye. I froze to take a look. That's when I spotted the buck. While holding the chair between my legs, I eased my binoculars up to take a good look at him. He then saw me. He broke and ran down the ridge. I lowered my binoculars, let the chair loose, grabbed my rifle and started to find a good opening in the brush to take a shot. I found an opening in his path, put the scope on the opening and waited for the good shot. After the shot, the buck went into a small thicket, I bolted and waited to see if was going to come out the other side. I then heard a crash and I walked to my right about 20 yards and saw the buck lying on the ground. All of this happened in just a few seconds. The funny thing about this story is that I scouted this property two days before the season opened. 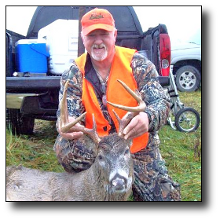 I was sitting in that same chair watching the soybean field that afternoon and this same buck walked across the field, straight to me and walked by me no more than 20 yards, and never knew I was there. So that's about it. A lot of typing, but it all happened pretty fast.